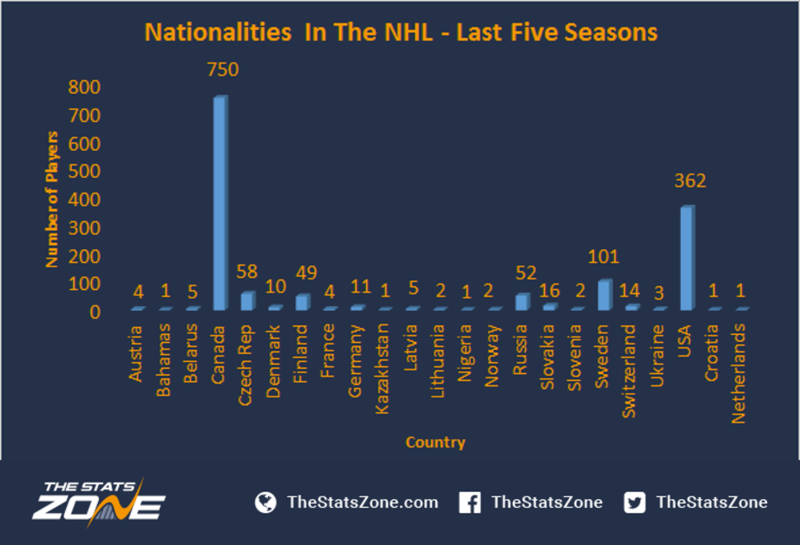 As the 2016-17 NHL season gets underway, we take a look at the breakdown of players in the league in terms of nationality. Using a sample of the previous five years, how does this look? Canada has the top spot with 750 players participating in at least one NHL game over the past five seasons, double the amount of players as USA – a distant second with 362. In third-place we can find Sweden with 101 players. Other notable countries include Czech Republic with 58, Russia with 52 and Finland with 49. Any surprising presences? Well, we have Bahamas and Nigeria with one player each. In the case of Bahamas, Andre Deveaux played nine games for the New York Rangers in the 2011-12 season, tallying just the one assist. Nigeria on the other hand, had Akim Aliu who played a total of seven games with the Calgary Flames as a right winger between 2011 and 2013, scoring a goal and adding two helpers. 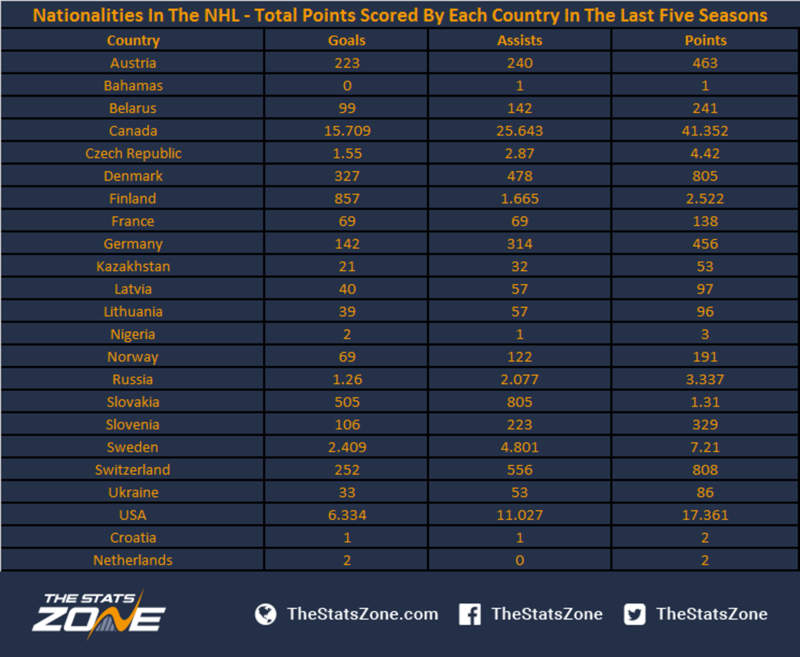 Continuing with the geography lesson, here’s a breakdown of how many points each country has scored during the aforementioned five-season span. Which country has been the most productive? Let us now turn our attention to individual players by continent. 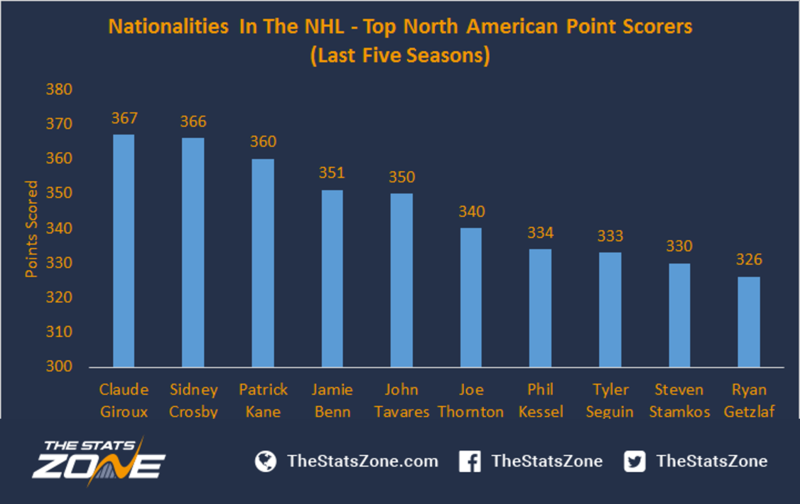 Firstly, who have been the leading point scorers in North America over the past five years? We can see Giroux, Crosby and Benn near the top, with Kane sandwiched between them. One thing that becomes pretty clear is that Canadian players are, in terms of numbers, far more productive than their American counterparts. We can find eight Canadians in the Top 10, 15 in the Top 20 and only 29 in the Top 100. The league offices are based in the States, but there’s no doubt Canada rules the game. And if we only count European players? Ovechkin and Malkin the top the list, and what’s really surprising is the fact that Erik Karlsson sneaks into the Top five with 314 points (82 goals and 213 assists). The Swede is the only defenseman in the Top 10. To put things into perspective, Karlsson has been more productive on offense than players like Henrik Sedin, Daniel Sedin, Pavel Datsyuk, Marian Hossa and David Krejci. If we want to talk about consistency, Jagr can’t be overlooked. The 44-year-old winger ranks 10th over the last five seasons with 269 points. 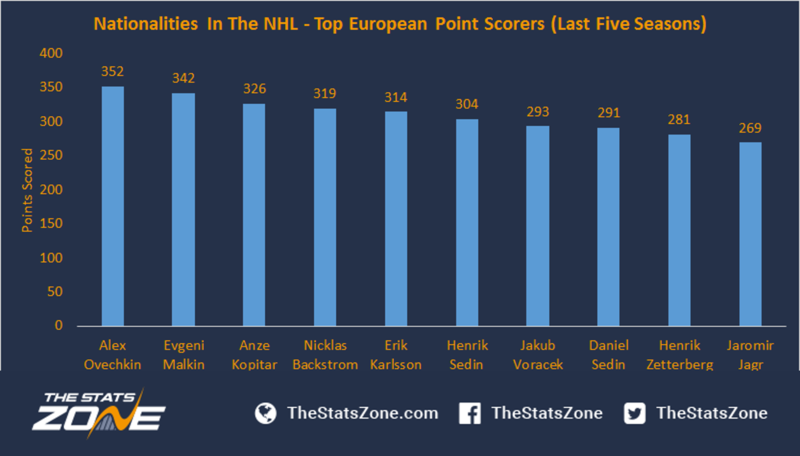 Sweden dominates with five players in the Top 10 (Backstrom, Karlsson, Henrik and Daniel Sedin, and Zetterberg), but Russia have the two most productive in Ovechkin and Malkin. Rounding out the Top 10 we find one player from Slovenia (Kopitar) and two from Czech Republic (Voracek and Jagr).